The AIRY Natural Air Purifier pot is perfect for succulents. Grow succulents in your home while cleaning toxic indoor air at the same time! The AIRY plant pot has been proven to help clean indoor pollution in homes and offices more than just plants by themselves. AIRY´s contemporary design makes it not only a trendy accessory for your home or office, but also a healthy one. What most of us don’t know is, that indoor air is frequently more polluted than outside. This is called the Toxic Home Syndrome. The air we breathe inside can contain up to 900 harmful chemicals (volatile organic compounds) or particles. The average person spends 90% of her time inside. Indoor air quality matters! This is where AIRY helps in a natural way. A NASA study published in 1989 identified the roots as the key to cleaner air. This is what AIRY does. 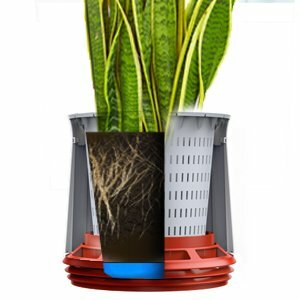 Our patented pot increases the air flow past the roots of the plants by a factor of 8. The AIRY-System can neutralize about 75% of the most dangerous environmental toxins in a room of 200 sqf (roughly 50 cbm) in only 24 hours. What this means for you: a lot of fresh air! At the same time, AIRY provides the plant with ideal conditions to grow. With AIRY, ANY plant will grow magnificently through ideal care. Compared to plants in ordinary pots, AIRY plants grow bigger and are much healthier. You can find some 30 plants worldwide, which are capable to convert pollutants into nutrients. This process only happens to a small degree in the leafs of those plants – up to 90% of the effect is happening in the roots! A key requirement: the roots must be able to breathe. 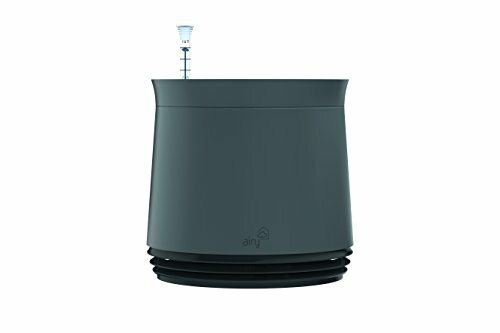 AIRY is the first plant pot, which cleans the air indoors.One AIRY system (pot, substrate, plant) can neutralize about 75% of the most dangerous environmental toxines in a room of 172 sqf (16 sqm) in only 24 hours. 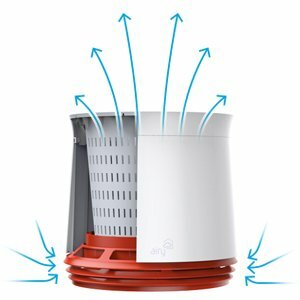 AIRY is 8 times more effective than a usual plant pot in purifying your indoor air from pollutants like Benzene, Toluene, Formaldehyde and Ammonia, and it doesn’t need power and no filter! It is 100% natural. AIRY is not only a well designed accessory for your living area, it also keeps 1.6 liters of water. The watering interval can be reduced to a minimum. Also potting the plant is reduced to a bare minimum and repotting is a thing of the past. AIRY limits the growth of the roots: roots grow as long as there is resistance through the soil or a pot. When a root reaches the vents of our AIRY pot, it stops growing. As you can see, AIRY comes with a “green thumb”. “The toxic home syndrome” or “Sick Building Effect” are well established facts. The UK government published a website to highlight the side effects of cleaners, glue, paint etc. Indoor air may contain up to 900 harmful chemical and biological pollutants. We spend 90% of our time indoors. method to clean the air in space and found that plants are the best method. AIRY is supporting “Klimapatenschaft”, a German based organisation for managing “green logistics”. As a first step our shippings are carbon-neutral. Click through to choose from 8 different colors of the AIRY – Natural Air Purifier Pot!